The final showdown between Shadowman and Master Darque has finally arrived…but those that Jack Boniface holds dearest will be the ones who suffer the most brutal blows of all. Trapped in the Deadside with his powers at an all-time low, Jack is about to suffer a devastating betrayal as Master Darque’s ultimate plan stands revealed. Now, with the Brethren on the verge of wiping out the last of the Abettors in New Orleans, and the Deadside threatening to explode into our world, Jack will have to call on everything he’s got to stop them…or lose it all trying. The final battle foretold since issue #1 happens here…but there will be no victory, just survival, when Master Darque leaves his mark on Shadowman #9 – in stores August 7th! 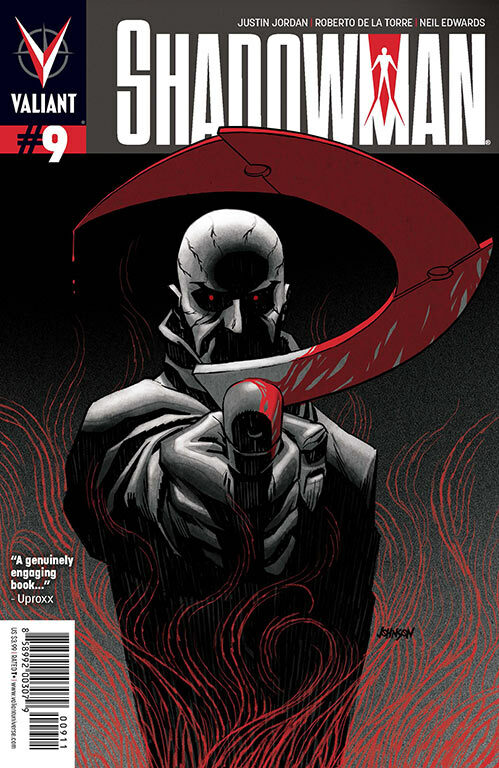 Cover- Black, grey and red are the dominant colors and all the shades in between them combine to make a very somber cover for this month’s Shadowman. Master Darque also gets the spotlight once more this time holding Shadoman’s sickle which drips with blood. Not very detailed but I like it. Action- The action scenes flowed well despite the inconsistency in art. Villain- Ladies and gentlemen Master Darque the deep existential villain who I have fallen in love with is here in all his misguided glory. This issue Darque reveals his plan is not to conquer the world so much as gather enough power to remake the universe by deposing what he calls an evil “god”. I can see how he arrived at that definition of god when you consider that he and his sister were born just to be his father’s instruments of power. I can see Darque questioning why a god who is supposed to be all good would allow that and countless other things to happen. I like Darque! Colors- Brian Reber is on color duty and he’s the star of the show. His colors bring life to the inconsistent art. Dazzling arcane magic, luminescent eyes etc it all looks damn good! Black Hero- The New Jack Boniface saves the word and Alyssa is…..here. Inconsistency– This issue could have packed quite the emotional punch but didn’t, thanks in no small part to the weak a$$ artwork. Now don’t get me wrong the action was adequate but especially that last page didn’t have the desired effect because the art could not convey facial features and/or emotions at all. Superhero– Jack Boniface is cool but nine issues in who he is in the sea of all this supernatural hero stuff is just plain lost. This is not a book like Quantum and Woody the original Batwing or Ultimate Comics Spider-man where there are actual well fleshed out multidimensional human beings who happen to be thrown into extra ordinary situations with a side of superheroics thrown in for good measure. 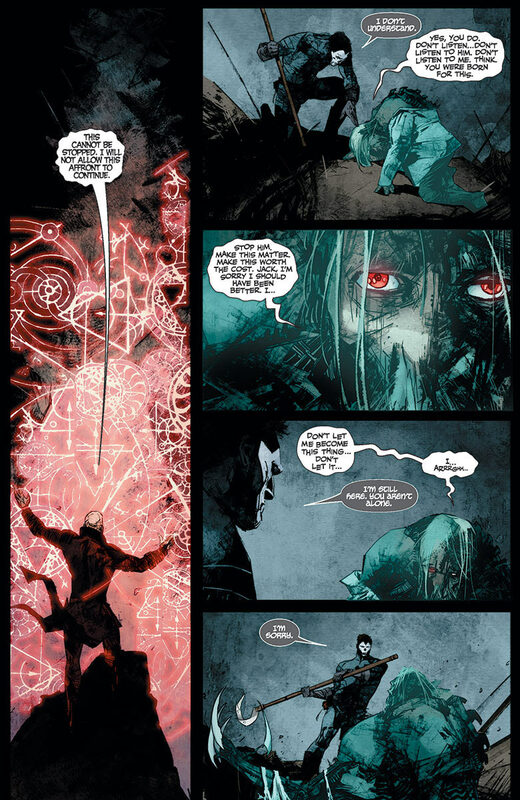 Shadowman has failed on the fundamental level of creating a connection between the reader and the hero. 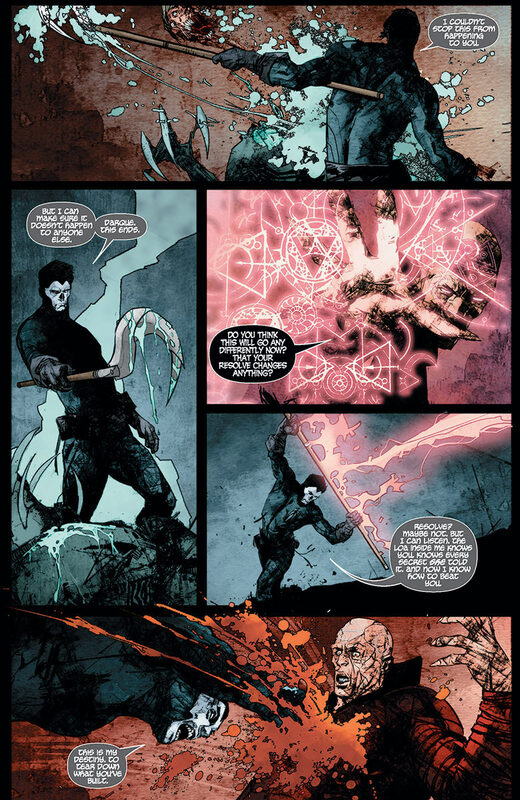 Shadowman #0 made me care more about Master Darque in one issue than I care about Jack in nine. This is something the writers will seriously need to deal with going forward. Its great to have a superhero book on the shelves but that connection that this book is missing is what keeps readers hook for months on end if not for a lifetime. Supporting Cast- The death of Dox could have been handled allot better. Here is a character who serves the same role as Giles did to Buffy (And there are so many parallels to be drawn between Buff and the New Shadowman I might add) but the connection between Jack and Dox was never established making that death while heroic kind of hollow on the emotional front.